After entering one of the synergids, the pollen tube releases the two male gametes into the cytoplasm of the synergid. One of the male gametes moves towards the egg cell; and fuses with its nucleus thus completing the syngamy. This results in the formation of a diploid cell, the zygote. 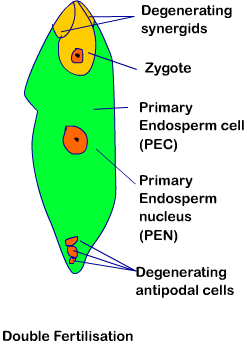 The other male gamete moves towards the two polar nuclei located in the central cell and fuses with them to produce a triploid primary endosperm nucleus (PEN). As this involves the fusion of three haploid nuclei it is termed triple fusion. Since two types of fusions, syngamy and triple fusion take place in an embryo sac the phenomenon is termed double fertilization. Double fertilization is unique to flowering plants. The central cell after triple fusion becomes the primary endosperm cell (PEC) and develops into the endosperm while the zygote develops into an embryo. Following double fertilisation, events of endosperm and embryo development, maturation of ovule(s) into seed(s) and ovary into fruit, are collectively termed post-fertilisation events. Endosperm: Endosperm development precedes embryo development. The primary endosperm cell divides repeatedly and forms a triploid endosperm tissue. The cells of this tissue are filled with reserve food materials and are used for the nutrition of the developing embryo. In the most common type of endosperm development, the PEN undergoes successive nuclear divisions to give rise to free nuclei. This stage of endosperm development is called free-nuclear endosperm. Subsequently cell wall formation occurs and the endosperm becomes cellular. The number of free nuclei formed before cellularisation varies greatly. The coconut water from tender coconut is nothing but free-nuclear endosperm (made up of thousands of nuclei) and the surrounding white kernel is the cellular endosperm. Endosperm may either be completely consumed by the developing embryo (e.g., pea, groundnut, beans) before seed maturation or it may persist in the mature seed (e.g. castor and coconut) and be used up during seed germination. Embryo: Embryo develops at the micropylar end of the embryo sac where the zygote is situated. Most zygotes divide only after certain amount of endosperm is formed. This is an adaptation to provide assured nutrition to the developing embryo. Though the seeds differ greatly, the early stages of embryo development (embryogeny) are similar in both monocotyledons and dicotyledons. 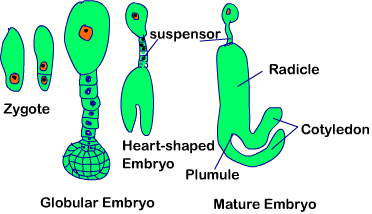 Figure 2.13 depicts the stages of embryogeny in a dicotyledonous embryo. The zygote gives rise to the proembryo and subsequently to the globular, heart-shaped and mature embryo. Dicot Embryo: A typical dicotyledonous embryo, consists of an embryonal axis and two cotyledons. The portion of embryonal axis above the level of cotyledons is the epicotyl, which terminates with the plumule or stem tip. 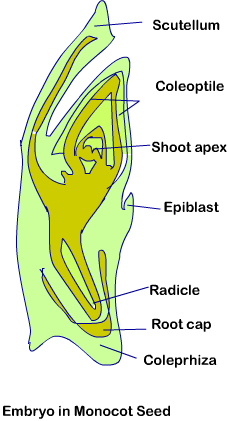 The cylindrical portion below the level of cotyledons is hypocotyl that terminates at its lower end in the radical or root tip. The root tip is covered with a root cap. Monocot Embryo: Embryos of monocotyledons possess only one cotyledon. In the grass family the cotyledon is called scutellum that is situated towards one side (lateral) of the embryonal axis. 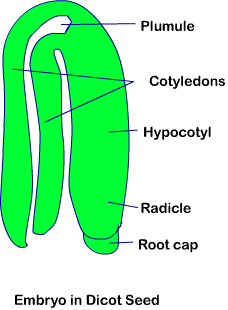 At its lower end, the embryonal axis has the radical and root cap enclosed in an undifferentiated sheath called coleorrhiza. The portion of the embryonal axis above the level of attachment of scutellum is the epicotyl. Epicotyl has a shoot apex and a few leaf primordia enclosed in a hollow foliar structure, the coleoptile.